WARDJet Waterjet Blog: One More, Out of the Door! One More, Out of the Door! 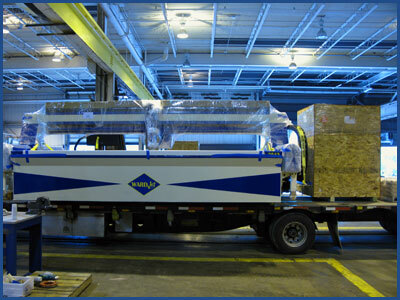 We're shipping another of our newest machines! 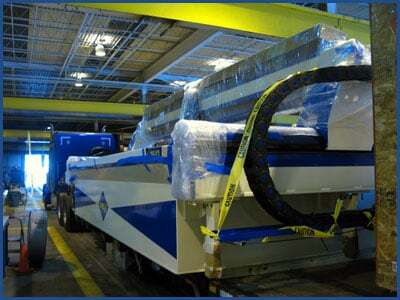 We're loading up and sending another of our Z-2543 models to another customer. The Z-2543 is an extremely versatile water cutting machine, that will open all sorts of new possibilities for our customer. If they would ever like to expand the capabilities of their waterjet, it's easy with a WARDJet. All of our machines are able to be easily upgraded as we use standard parts throughout our machine lineup. If you'd like to increase productivity and push the boundaries of what's possible in your business, contact WARDJet today to begin designing your perfect waterjet. Looks great! I didn't need to call my locksmith in Wichita to get this one out the door.